ZZ Top sets out to conquer Europe. In 1980, while on tour for Deguello, ZZ Top was looking to expand their fan base to a worldwide market. Already popular in America, the band wanted to conquer Europe next. An opportunity presented itself in the form of the popular German television show, Rockpalast, which broadcasted throughout Europe. 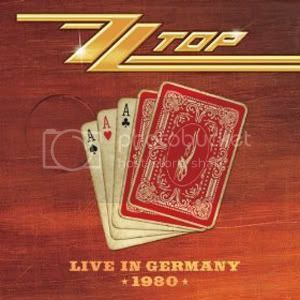 Taking the stage at 4:00 a.m., the band played a spirited set that makes up the CD, ZZ Top – Live In Germany 1980. After the intro music of "El Deguello," the band launches into a fierce version of the Sam and Dave classic, "I Thank You." Billy Gibbons' guitar tone is massive throughout, even if bassist Dusty Hill's vocals are way too high in the mix. The band segues straight into two gems from Tres Hombres — "Waitin' For The Bus" and "Jesus Just Left Chicago" — with Gibbons delivering blistering leads on both and changing the lyrics on the latter to "took a junk right here in Essen, Germany" in honor of the host city. While a staple of their live shows, "Manic Mechanic" remains one of the stranger ZZ Top songs, blending Frank Zappa with Texas blues. Somehow, it doesn't seem out of place in their catalog though. The band's high-octane versions of "Heard It On The X" and "Beer Drinkers & Hell Raisers" leave their studio counterparts in the dust, particularly the latter, which is played at a frantic pace. Gibbons announces that it's "blues time" before a slow, sleazy "Fool For Your Stockings" where he laments the many crosses we bear in life, his killer soloing emphasizing his point. Perhaps the highlight of the show though is the band's signature "La Grange," combined in a medley with 'Sloppy Drunk" and "Bar-B-Q." The band is firing on all cylinders here, making all three up-tempo songs work as one. This is ZZ Top at its finest. The CD closes with yet another classic, "Tush," with Hill on fiery vocals. Gibbons shows off his slide prowess on this classic track. The rest of the world may have caught on to ZZ Top with Eliminator and their popular MTV videos but the band had a killer catalog of songs well before that. Live in Germany 1980 shows just how big a sound the three guys from that "little ol' band from Texas" can make and should be in any fan's collection.